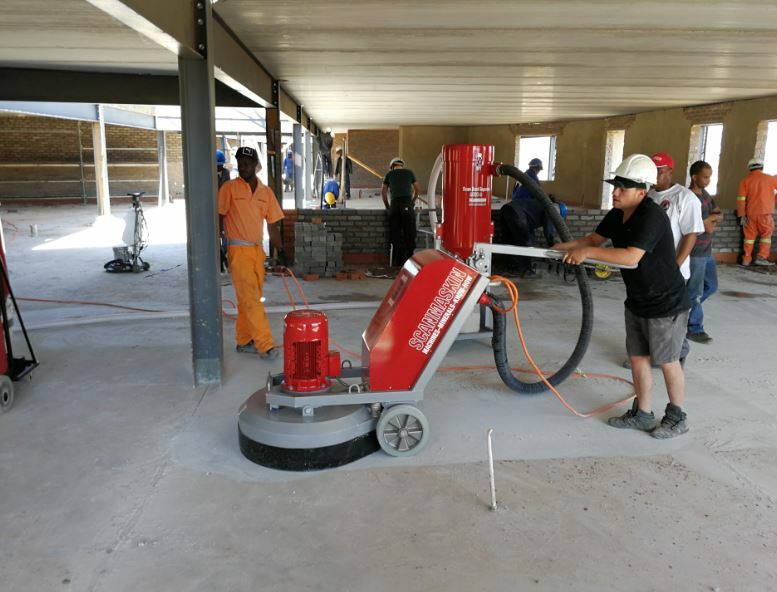 Mactool recently advised flooring contracting company, SA Floors, to invest in the ScanCombiflex 800 DSP grinder for a school project in South Africa. The machine, which is manufactured by Scanmaskin Sverige AB, is considered to be the optimal helper for fast, efficient floor grinding and polishing. Jacques Malan from SA Floors says that he is very satisfied with the machine and that it helped his team complete the project efficiently. “SA Floors recently used the ScanCombiflex 800 DSP grinder on a school project and I’m pleased to report that investing in this machine was the right decision,” says Jacques. Geoff Mclea, Sales Director at Mactool, describes the ScanCombiflex 800 DSP as an ‘intuitive’ piece of equipment. “It basically guides you through the entire grinding process via an integrated computer positioned on the machine’s control panel. Through sensors, the machine picks up when the operator is moving too quickly or slowly, when the tool wear is too much, or if any other variable isn’t being applied optimally. The tool guides the operator to optimal consumption,” says Geoff. Besides the equipment’s intuitive nature, built entirely out of steel, it is also robust and stable, making it ideal for commercial projects. It is equipped with a patented drive system to power the three grinding heads and the drive system is constructed with high-quality components like a double-sided toothed belt in combination with a ring gear. The weight of the machine is 380kg and its power specifications are 11 kW, 32 Amp, 3-phase. For more information, contact Mactool on +27 (11) 823 1077 or via www.mactool.co.za.